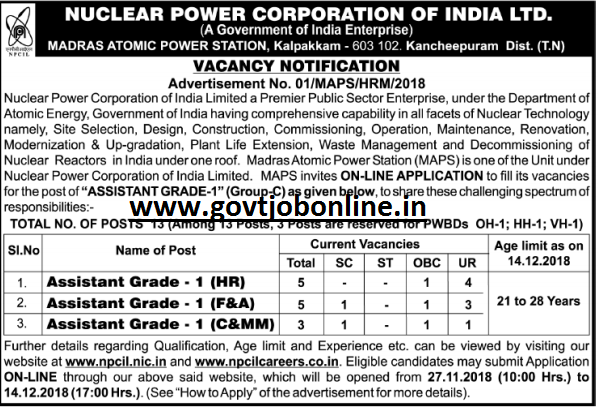 NPCIL Assistant, Steno Vacancies Recruitment : Nuclear Power Corporation of India NPCIL requires application forms in prescribed format from Male or Female aspirants for the posts of Steno Grade I and Assistant Grade-I(HR, F&A, C&MM). As per Notification, total available posts are 13. Application mode is offline. Candidates may apply online for this NPCIL Kalpakkam vacancies of Assistant Grade 1 ((HR, F&A, C&MM)) from 27-11-2018 to 14-12-2018. The official notification has been uploaded. 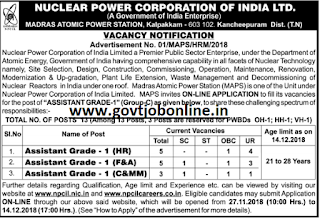 Total information regarding NPCIL Nuclear Power Corporation of India Ltd Assistant Grade 1, Steno Recruitment Notification 13 Govt Jobs is mentioned below. As per Notification of Nuclear Power Corporation of India Ltd, total available posts are 13. Candidates may submit application form online only. Candidates please go through official Notification to get Educational Qualification details for Steno Grade-I, Assistant Grade-I Posts. Minimum age limit must be 21 years and maximum age limit must be 28 years as on 14-12-2018. For Steno, Assistant Grade-I Vacancies candidates will get Rs.25500/- Basic Pay Scale per month. Aspirants should submit application form online through the official website of NPCIL Nuclear Power Corporation of India Limited (http://npcil.nic.in/). Fill it with required details and submit application form before the due date of 14-12-2018.